Relax & enjoy while bringing the golf course to your home with these Personalized Golf Mixer Glasses. 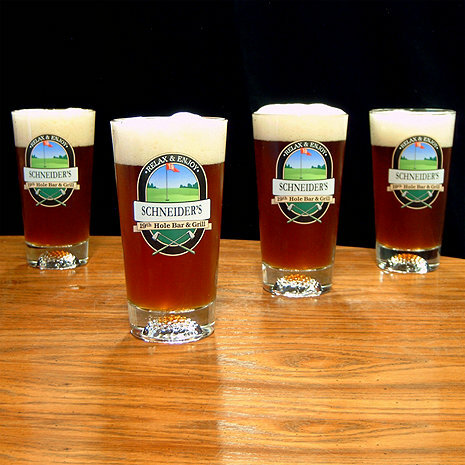 Perfect for your favorite craft beer and spirits - These glasses are sure to be a hole in one! Relax & enjoy while bringing the golf course to your home with these Personalized Golf Mixer Glasses. Perfect for your favorite craft beer and spirits - These glasses are sure to be a hole in one! What are the size of these glasses, or how many ounces do they hold? They are 16oz. pint glasses. These are 16 ounce glasses. Can you get this golf design for whiskey glasses with a monogram? Gave as a gift to a person who has everything.